Get ready to clean out your medicine cabinets and throw away all the beauty products you’ve collected over the years, because we’ve found a simple solution to gorgeous glowing skin. What you might not know is that the skincare products you have been using may be causing more harm than good. And just because a product costs a lot of money and is from a well-known brand, does not necessarily mean it’s great for your skin. While all skin types are different, many of us suffer from overly dry and treated skin. Dry skin is the #1 cause of premature aging, wrinkles, and fine lines. So if you want your skin to be glowing and gorgeous you need a beauty regime that focuses on hydration, hydration, and hydration! These 3 steps are the easiest way to keep your skin mega hydrated without having to book fancy skincare appointments. Say buh-bye to a complicated skincare routine with tons of product, while saving hundreds to thousands of dollars on skincare products (because they don’t even work). So here is our secret steps to glowing and hydrated skin. Health authorities advise that drinking eight 8-ounce glasses of H20 is best to keep yourself hydrated. Fill up a pretty BPA free water bottle so it’ll kindly remind you to drink up! 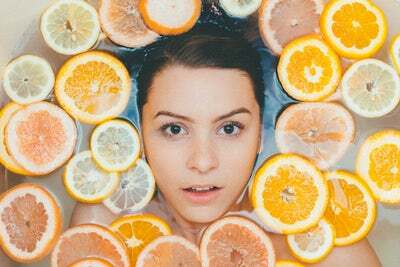 Research shows that Vitamin C is an essential antioxidant that hydrates and moisturizes your skin. It also gets rid of fine lines, diminishes the appearance of sun spots, wrinkles, and stimulates the production of collagen! But, you can’t just use any Vitamin C product. Your Vitamin C serum has to be stabilized or it will not work! Our favorite clean and stabilized serum is Vibriance, put it on before bed and in the morning– your skin will be illuminating. Over-moisturizing your face can actually make it drier, especially when there are so many preservatives and harsh ingredients in many moisturizers. So stick to 1 clean product instead overdoing it on your skin. Sometimes, less can really be more. We highly recommend taking a before picture and write down how your skin feels before you try this method. As your skin adjusts to the new regime, you’ll start to notice how supple and hydrate your skin will feel with less product.